PVI Bariatric multifold ramp is constructed with durable welded fabrication. The bariatric ramp features a visual aid to determine if ramp is on a safe slope prior to use. Multifold ramp has anti-slip surface which provides good traction, and the patented center joint hinge eliminates pinch points and adds strength. BAR636 6' 36" 38 1/4" x 17 1/2" x 11 1/2" 58 lbs. 800 lbs. The PVI Bariatric Multifold Ramp combines patented design, lightweight materials, and superior strength to give you the most versatile access ramp available. 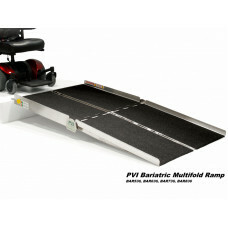 PVI is the original creator of the Multifold Ramp and while there have been many copies, no one can duplicate PVI’s perfect combination of strength, weight, and safety. With a range in lengths from 5 ft. – 8 ft., the 36" wide Bariatric Multifold Ramp by PVI is sure to fit your access needs. Folds in half - carries like a suitcase. Separates when needed. QuikCam allows ramp sections to separate and join easily with no extra tools or hardware needed. Safety guide indicates proper slope. Tested at a 3X safety factor. Limited lifetime warranty. Edge-to-edge superior safety traction tape on top surface. Full platform provides excellent stability. Closure straps lock ramp panels together for safe carrying.